Between 2007 and 2008, Gallup conducted the first comprehensive survey of global opinions about climate change, asking respondents in 128 countries about their awareness of the issue and the extent to which they perceive climate change as a threat to themselves and their families. Overall, Gallup's data reveal a majority (61%) of the world's adult population knows at least something about global warming. Forty-one percent are aware of the issue and perceive it as a serious threat. Together, China, the United States, India, Russia, and Japan account for more than half of the world's greenhouse gas emissions. Separately, each has started down the path toward Copenhagen from different places and each has its own perspectives on the culpability of developed and developing nations. Many observers believe the top emitters -- particularly China and the United States -- will need to walk together to get others to follow. Public opinion about climate change across this mix of developed and major developing economies reveals some remarkable similarities and differences, both in awareness and in the perceived level of threat that global warming poses. In China, which rivals the United States for the top spot on the greenhouse gas emitters list, the 62% who are aware of climate change falls roughly at about the world's average. However, China stands out among these five countries because its public perceives global warming as a relatively low threat. Gallup's survey, which is representative of both urban and rural areas, reveals that the general Chinese perception of climate change as a relatively low threat is pervasive across demographic and geographic groups. Awareness is higher among urban Chinese (77%) than rural Chinese (52%). But even within urban and rural areas, education has an independent, additional effect on awareness. As education levels increase, so does basic awareness of climate change. When we separate those adults who are aware, we find that urban Chinese are slightly more likely than rural Chinese to perceive climate change as a serious issue to them personally. Although education does have an independent effect on perceptions, all groups show a relatively low level of perceived threat of climate change. Like China, India is one of the fastest expanding economies in the world, and as such, its energy needs will only increase over the next decade. Still largely agrarian and poor, India has opposed emissions caps that could potentially curb its growth and maintains that developed nations should shoulder most of the burden. However, India has committed to not increasing its per-capita emissions above those of developed countries and is increasingly looking into alternative fuel options and energy efficiency at home. Of the top five greenhouse gas-emitting countries, awareness is lowest in India, where only about a third of adults say they know at least something about climate change. As in China, this awareness correlates with urbanicity and educational attainment. In urban India, 49% of adults know at least something about climate change, whereas in rural India -- where more than two- thirds of the population lives -- 29% does. Within urban and rural India, awareness increases significantly with educational attainment. While Indians are the least likely of the top five greenhouse gas-emitting countries to report awareness of climate change, they are more likely than the Chinese to say the issue is serious to them. Indians who are aware of the issue are likely to perceive it as a serious personal threat (29% of the total adult population in India). As India's energy needs increase over the next decade, the country will likely face a challenge as it communicates climate and environmental measures to a public that is highly unaware of the climate change issue. In Japan, Russia, and the United States, interestingly, where awareness is substantially higher than in China or India, perceptions vary about the seriousness of the threat that climate change poses. Of the citizens from the top five greenhouse gas-emitting countries, the Japanese are the most likely to say global warming represents a serious threat to themselves and their families, with 80% rating the phenomenon at this threat level. It is too early to tell what impact the recent government change will have on climate change policy in the world's second-largest economy. Japan's Democratic Party, which swept to power in late August, had pledged to cut emissions even deeper than the outgoing government. Such efforts may be a tough sell, however, as Japan emerges from deep economic recession. Historically, the United States is the only country among the top five emitters not to ratify the Kyoto protocol. However, since the Obama administration took office, climate change policies have started to shift. 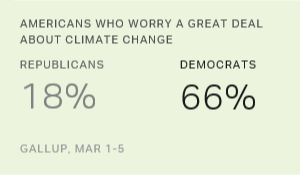 Results from Gallup's surveys in 2007 and 2008 show that almost all U.S. citizens aged 15 and older are aware of climate change, but a sizable 35% do not believe climate change is a serious threat. In this way, the United States is similar to Russia and China, where more than one-third of the population is aware of climate change but does not see it as posing a threat. In Russia, one of the world's most energy-intensive economies, there are signals this year that climate policy is starting to undergo a shift. For the first time, Russia recently announced long-term plans for reducing emissions. At the same time, there may be reluctance to do so at a cost to economic growth as Russia experiences a deep slowdown. Despite high awareness among the Russian public, a minority of 39% is aware of global warming and says it presents a serious threat. In this regard, Russians' attitudes more closely align with attitudes in India and China than with those in Japan or the United States. For complete results for all countries, see below. Results from Gallup's surveys in 128 countries reveal that more than 8 in 10 adults in Europe and the Americas say they know at least something about climate change. Awareness is lower in the Middle East/North Africa and Asia regions and lowest in sub-Saharan Africa.